TEHNI S.A was established in Xanthi, in 1988, and its initial activity was the electrostatic metal dye. Due to company’s stable and continuous progress we managed to expand its activities by constructing privately owned buildings of 18.500 sqm, where Aluminum & PVC Panels, Mosquito Nets and Security Doors with aluminum or wooden facing are made.At the same TEHNI S.A. has four sophisticated dye houses. Two of them are for electrostatic use and two of them for wood grain use (Decoral Use). Company’s leading presence in the market is due to a great variety of designs, its high product quality, its competitive prices and the continuous efforts in order to provide the best possible services in a modern distribution channel that includes more than 1.500 customers.The acquisition of International Certificates ISO 9001 for Quality Management System, ISO 14001 for Environmental Management System and ELOΤ 1801 for Occupational Health and Safety System is result of company’s dedication in continuous quality improvement. Through a project of continuous investments that took place recently, TEHNI S.A. achieved to establish itself in the Greek market as one of the leading and more developing companies in aluminium market TEHNI S.A. has already started expanding abroad.Its firstsubsidiary company has already been created in order to serve the market of Balkan countries where our company has a significant market share and leading presence.At the same time our company participates in big international exhibitions in order to attract customers all around the world. PANTELOS SA has 20,000 sqm facilities for the production of its goods.The products feature a range of quality certifications and sales are expanded in 28 countries around the world.With a staff of 170 people, stores in major cities of Greece and subsidiaries in Serbia, Poland and Turkey, currently the largest production panel Aluminum and PVC in South Eastern Europe. 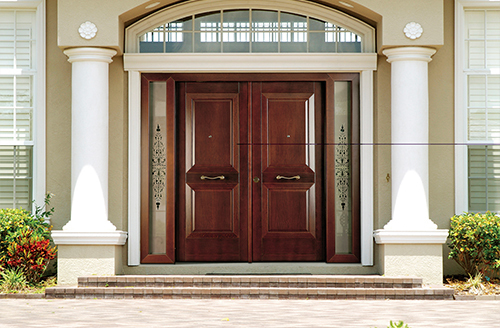 A pioneer in designing and manufacturing security doors, Golden Door constantly develops the design of its products, following the trends in contemporary design. 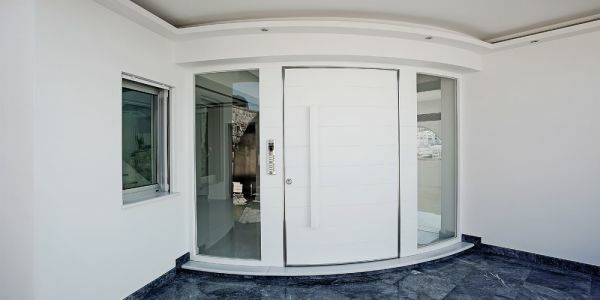 Drawing on 25 years of experience and always following consumer needs, it manufactures high-quality armoured doors for main entrances and internal security doors. Consistently focusing on Security, High Standards and Reliability, Golden Door has managed to identify its name with uncompromising quality. 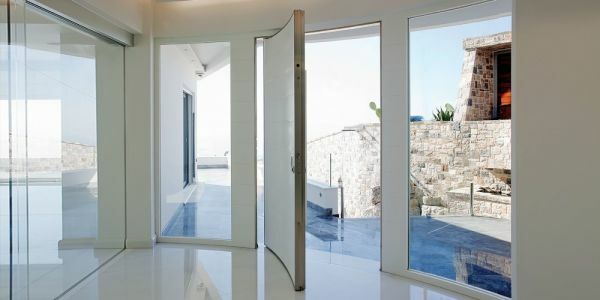 Through a wide range of products, such as pivot doors, doors with concealed hinges and special constructions, it offers excellent application solutions, creating a highly striking effect. The wide variety of materials it uses offers ultimate design freedom, while its patented door mechanisms ensure long product life. Golden Door’s high manufacturing standards mean its products are Class 3 and 4 certified as regards security, boasting acoustic insulation, fire safety and a low thermal loss coefficient. All manufacturing stages are automated, providing comprehensive quality control and a final product with mechanical strength and resistance to wear and tear, fully made in Greece. 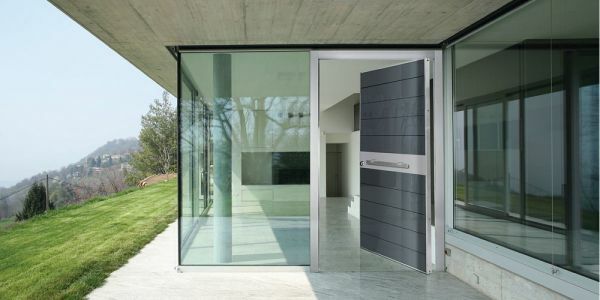 THERMOSECUR system has been invented, developed and patented by German manufacturer NOBLESSE, who is the only manufacturer of the most superior door system in the market. The THERMOSECUR properties in terms of deflection (No thermal deflection as with aluminum), insulation, protection, tightness to wind etc. 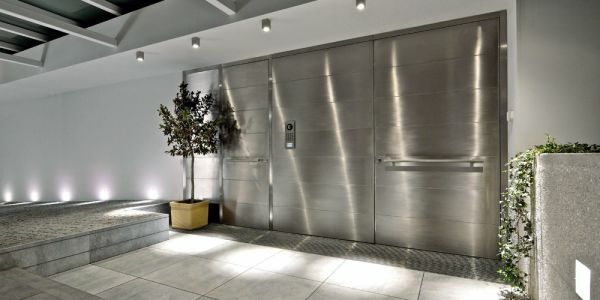 are far, very far superior to those of Aluminum doors in general. 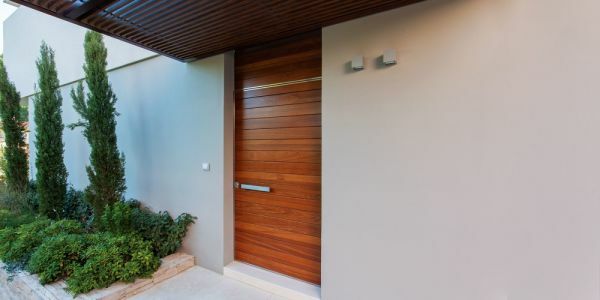 They are the same weight or even heavier, more solid, look and feel exactly like a heavy wooden door, even better, are WK2 security certified and have by far best thermal insulation in the market! · Totally Maintenance free, combination of high-tech composite materials, SMC technology (car industry). · Thermal insulation: BELOW 0, 8. below low energy standard. Model “Rotterdam” for example has a U-Value of unheard 0, 49. · UD values from as low as 0, 49 to 0.78, which is sensational. · Tested to a wind load of unbelievable 2000 PCAL. Highest classification. · 80mm frame, 86mm door leaf. · Triple glazing in 77mm! 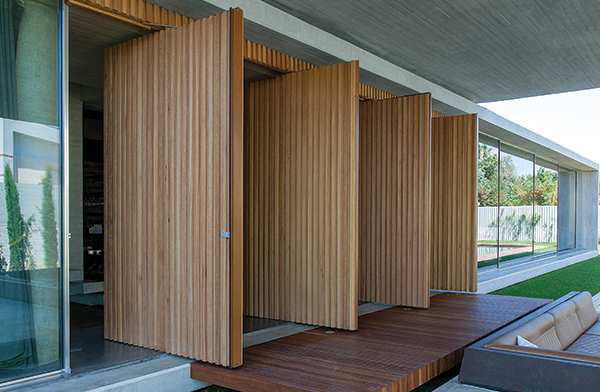 · All doors come up to 1200mm wide and 2350mm high without surcharge!!! · Locking Systems: GU, Gretsch-Unitas Security Automatic or 5-Point Mechanical with Electric Door Opener (Buzzer), All Made in Germany. · Roller Hinges, 3-D adjustable from Anuba, Germany. · All Handles made in Germany, Handles containing Wood do not feature any tropical woods, but only woods from European sources. · THERMOSECURE doors are always “all in”, RAL Color of choice, max measurements (All doors come up to 1200mm wide and 2350mm high without surcharge), multipoint locking system, everything included as standard. “Komfort-Paket” Includes latest fingerprint Scanner Technology as well as Motorized 5-Point lock. · Fixed price system is easy. There are only 5 (!) prices groups for all designs, and 4 extra “packages”. Price Quote is made in 5 seconds. BIOPANEL was incorporated in 1975 focusing its activities on special metallic structures and factory equipment. In 1990 it started the production of panels and soon became one of the largest and most successful companies in the sector. 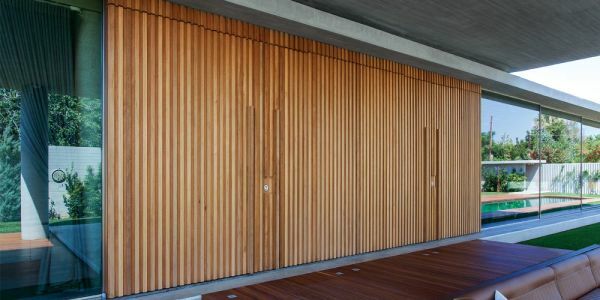 Adhering to its vision, it has kept investing on technological development and skilled staff, thus offering top quality functional panels that feature innovative designs and unique aesthetics. 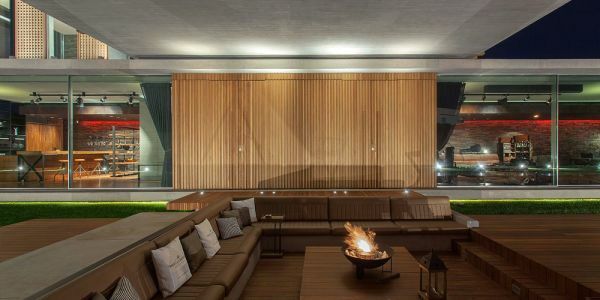 BIOPANEL presents new product series, with emphasis on the wide variety of stainless steel panels and at the same time, it has pioneered thanks to the release of an excellent series of traditional panels, and especially those featuring a large external rail. By taking advantage of the latest developments and trends in the market BIOPANEL is now releasing aluminum Armoured Doors, by customizing modern architecture and total safety to your own requirements, combining traditional or modern designs with the reliability of its name. A very broad selection of pressed, traditional, traditional with large rails and inox. Unbeaten safety and diachronic endurance because of aluminum, in a variety of designs, colors and texturing. 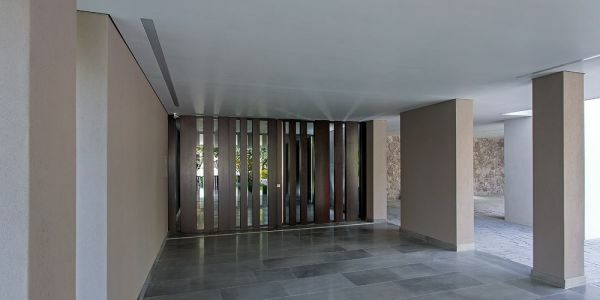 System bio100 of anodized aluminum rails, in stainless steel (inox) color. Aluminum entrance canopies, which are available in various colors through the electrostatic painting system. New range of large inox door knobs, suitable for every aluminum door type and design with great endurance and modern style.